I cannot say that this surprises me. The Diviners has been a solid series since the first instalment, and I have loved every word since it has begun. 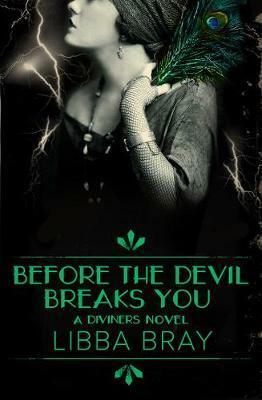 Before the Devil Breaks You comes with some pretty high stakes. The storyline is creepily progressing, as are each and every character. I pretty much adored everything about this book, but if I have to pick a favourite, I can only narrow it down to those two things – the creepy factor and the characters. I have always loved all the characters in this series, for very different reasons. The characters are diverse and interesting, complex and intriguing. I felt that there was a fairly even spread of “screen time” for each of these characters (either separately or with others as part of their story). And I felt that a lot of the characters grew in this book. But there are so many mysteries yet to be unravelled! There were laugh-out-load moments, and some heart-wrenching ones as well. This story is nail biting yet glamourous. I adore the 1920s New York setting, with all the slapper glam and trails of the time. The setting is eloquently and honestly executed, with all the beauty and horror of the 1920s. As I mentioned before, this story is filled with a whole cast of diverse characters. It is one of my favourite things about this book. But it is not just the culturally, sexually or socio-economically diversity that I enjoy. I love the fact that all the characters, whether or not they fit into one of the minorities represented, are diverse as characters themselves. Each has their own strengths and weaknesses, their own trials and tribulations they must face. And every character is there for each other – no matter what their differences. Don’t get me wrong, it is not all glitz and glamour. The story does not shy away from the non-supernatural horrors of the time. This story does contain, or touch on, racism, antisemitism, sexism, violence, sexual assault, abuse, ablism, homophobia and many other horrible aspects of humanity. And although this series does contain such things, this is not one aspect that is glamourised. I credit Libba Bray for not excluding them and dealing with such issues in a respectful, challenging, honest and very human way. The creepy supernatural element is brilliantly executed, and masterfully the centre-piece of the story, without it swallowing the story as a whole. The supernatural and real-life aspects are beautifully entwined without one over-riding another. This is a true testament to Libba Bray’s carefully shaped and amazing writing abilities. Of course, the supernatural part is a big aspect of this story. And it is brilliant and creepy and masterfully written. The supernatural element has always been there, always lurking, but it is certainly kicked up a notch, especially towards the end. This is the second last book in this series, and it is intense. I will admit that I found Before the Devil Breaks You a little slower than its predecessors, but once it gets going, wow are you in for ride! There are certainly some twists and turns in this book that you will not see coming. There are plots that are closed, characters who come into themselves, and a whole lot of mysteries that lie in wait. Filled with magic and mystery, heartache and honesty, trails and triumphs, you will not be disappointed in the latest instalment in The Diviners series. Be warned, this book does close on a cliff-hanger that leaves your heart both aching and racing. Sidenote: I am so glad that Allen & Unwin have their own covers. The US covers just don’t do it for me (since the change). Thanks Allen & Unwin for keeping the covers matching! Another sidenote: If you want to give yourself a treat, you can also listen to this series on audiobook. The audios of this series are my absolute favourite audiobooks. The narrator, January LaVoy, is fantastic and really brings this story to life in a different way!